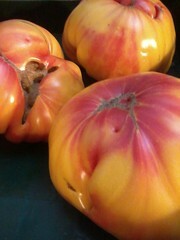 General Observations: Reading the log I am struck by the words, Tomatoes, Rain and harvesting. They seemed to dominate the record, like the rest of life and activity was not noteworthy. 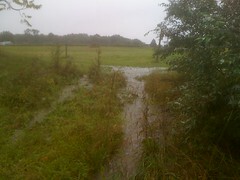 Total rainfall exceeded 20 inches, including 7 inches during Hurricane Irene on 8/27. So August is nose to the grindstone month, picking tomatoes, harvesting the regular mix and going to market, and weeding and mowing. There was also a ‘Mid Season Crew Check-in’ where the staff shared their perspective and task lists. Cash Flow doesn’t seem to be what was hoped, so manager is focused on identifying what crops can be increased without exceeding demand or losing time on something that hasn’t proven to be profitable. Equipment 30 hrs: 11 hours of the Kabota mower on diversions and mowing the market garden lanes and field borders. The Ford 4600 also had high hours; 13. The JD was only in use for 5 hours. Administration 65 hrs: As ever, accounting and payroll. Payroll for the month was $9,658 for 7 workers. Cash coming in is regularly deposited and quarters and ones retrieved for the cashbox. Infrastructure 108 hrs: Equipment repairs- JD loader, cylinder repaired, but MR struggled for a day to replace missing fitting. Casey helped MR remove, replace and remount tires on Ford, ATV and Hay Rake. Mowing seems to be the prime activity, including weedwacking the grass away from irrigation submains and valves and maintaining the fences. It was not clear in the log what these hours were for. Due to many rainy days there may have been many odd job hours assigned to Infra. 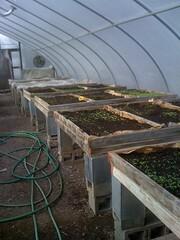 Greenhouse 20 hrs: Greenhouse actually cleared out this month with the next seedlings placed on tables outside. Last seeding of vegetable transplants, Succession #5, was done on 8/25 of Kale, Chard and Fennel. 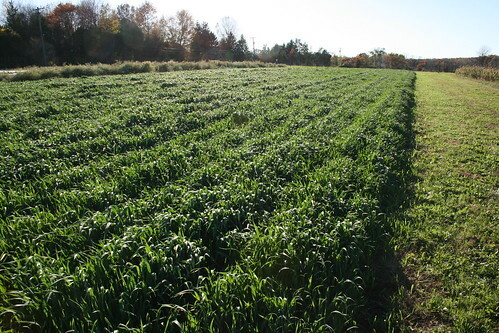 This was probably too late as these crops never really got established (partly due to wet conditions). Also, on 8/16 the “Winter Succession” of veggies was started, to be planted into Ralphs House and harvested in the deep, dark of Winter. Composting 23 hrs: No log entries for compost use but I assume there was composting done pre seeding the BGBs, just not recorded. Planting 29 hrs: 8/25 “big push” to get BGB’s ready for fall crops. Seeded salad, Tatsoi, Spinach, arugula and carrots. Crop Care 235 hrs: 8 entries for irrigation, mostly the Greenhouse Tomatoes. Bought Hay from neighboring farm for mulching Winter Squash. Heavy hand weeding in BGB’s to confront quackgrass invasion. Lost sections of rows of Tomatoes to Hurricane and all the flowers were blown over. Note in log; Always Stake and String Flowers! Harvesting 580 hrs: 8/2 excited entry in Log about “major tomato harvest”! At beginning of month extra tomatoes being held in Walkin Cooler to build up supply for Processing. By end of the month the log notes with dismay the severe decline in yield in tomatoes. Otherwise good yields of beans, beets and summer squash to keep the tomatoes company. Interesting data from greenhouse tomatoes that 320 row feet in the greenhouse had yielded almost as many pounds as 1,320 row feet in the field so far, 1420# and 1527#’s respectively. 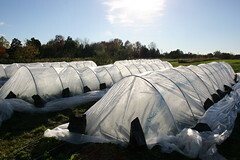 The greenhouse tomatoes had two weeks earlier production as well. 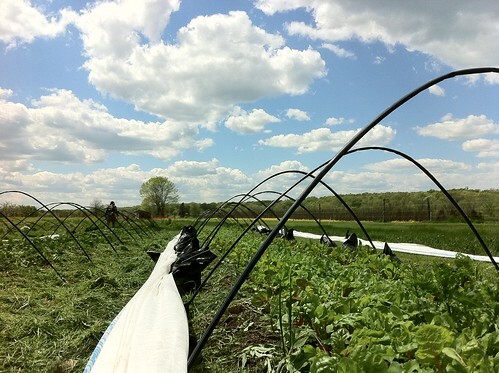 Handling 112 hrs: Field salad was down by a third from last month so too is there a decrease in handling hours. Chard too was way down. Flowers, scallions and washing beets were the bulk of time. Special Projects 29 hrs: SunHemp trial visited regularly by NOFA staff, recording growth over time. Germination was decent but the wet weather put a damper on the SunHemps vigor. It was also clear that when cultivating the seed in, the two center shanks must have thrown the seed to the center and wheel tracks, yielding poor coverage over 2/3’s of the bed surface. Also, Tomato Processing; 600#’s taken to Bauman Family Fruit Butters, inPennsylvania on 8/15. The yield was approximately 150 quarts, or 4-6 #’s per quart. At $3.70 cost per quart + $3-$6 in Tomatoes and the time involved managing it all, we came up with our cost at $7-$10 Quart, so we plan to retail at a minimum of $15/quart of ‘Heirloom Goodness’. BlackBird Meadows also reported an estimation that ‘start up of a small vegetable operation’ (1/2 acre) should expect at least $5,000 in costs. Weather: Heavy Rain Storms and wet soil. Week 1:Temperature mild, due to overcast days and rain. April of 2011 saw snow showers on April fools day and progressed to rain showers which created very wet conditions through most of the month, ending in a beautiful sunny day on the 30th. Notable issues were the water system leak, which delayed the use of the well irrigation. The rat traps were unsuccessful, instead only catching ants with the peanut butter bait, and subsequently some seedlings were lost to an opportunistic groundhog. Market sales included Hopewell market on Wednesdays beginning the second week of April, as well as sales to Kindle Café, Nomad and seedling sales to Whole Earth. There were few equipment issues other than vehicle repairs for Isuzu, Prius and Volvo. 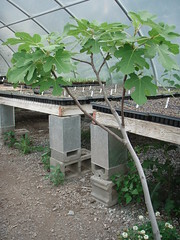 Tasks performed included finalizing the flowers and supplies order, ordering of fruit and nut trees. Preparing 1st quarter payroll reports for state of NJ, and finalizing the crop plan. The beginning of month saw a leak in the water system so the crew had to resort back to the farmhouse water supply. Later in the month, the crew dug up the pipe between the office and the farmhouse. Turns out the leak was coming from about 8 feet down from the nozzle, not at the elbow as was originally believed. The fence surrounding the Madonna needed repairing due to a problem with the posts not staying in the ground. Later in the month, irrigation of Ralphs house led to over watering and a trench had to be dug on the east side to drain it. Other duties included mowing of the market garden and Veg C, as well as the fence line and compost filtration strip. 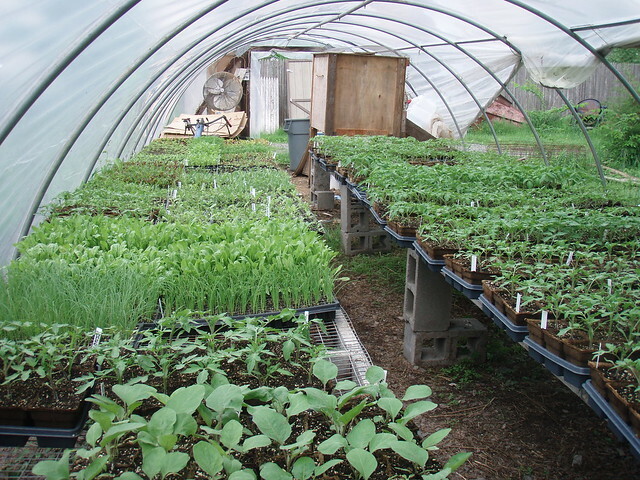 Greenhouse work consisted of an introduction to daily management including venting systems, seeding and watering. Cleaning /mulching of pathways and edges of interior, reorganizing and moving the seedlings to farm stand area to harden off and moved some to the hoop house. Potting of orange blossom, Rosa Bianca and orient charm for seedling sales. Grafting of tomatoes toward the end of the month. Composting consisted of Strawberry and Pea beds early in the month, then moved to Asparagus beds, Apple trees and other fruit trees and of course, lots of compost sifting. Potting of second succession seeding. Seeding of tomatoes, peppers, eggplants, arugula, tatsoi and flowers. Very wet conditions but nevertheless planting commenced following lots of rototilling and raking. 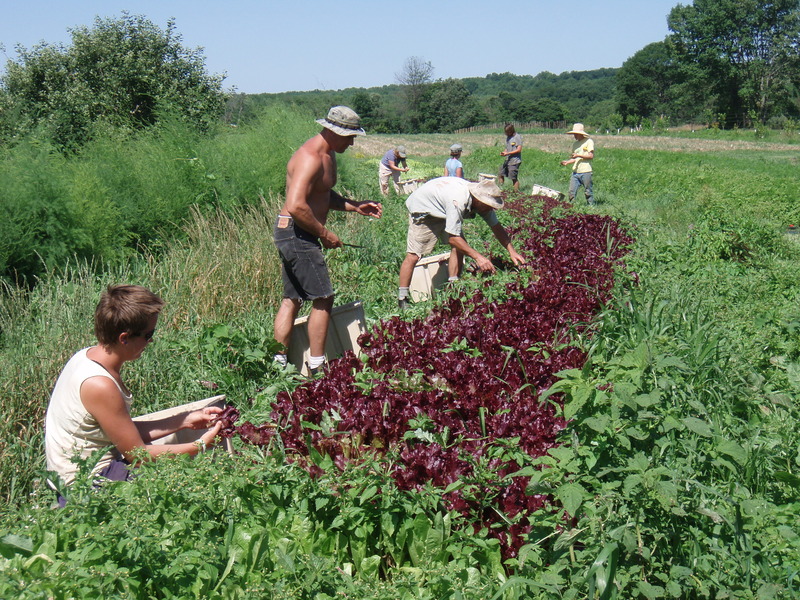 Direct seeding of lettuce on the 14th, planting of kale and chard on the shoulder of two beds, with turnips and radishes planted in the center of the beds. 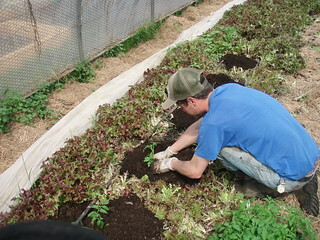 Planting of spinach (half bed) and swiss chard with beets down the center. 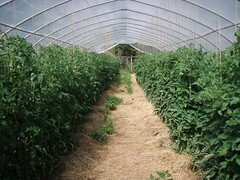 “New Girl” tomatoes planted in farmhouse gothic and Tunnel tomatoes in greenhouse. Weeding party on Saturday the 2nd resulted in completion of 2/3rds of the strawberry beds and beer and shrimp were the much-deserved reward that evening. Blackberries started peeking out on the 4th, Peas were planted on the 6th. Mulching of strawberry beds completed on the 8th. Uncovering of strawberries on the 14th. The 21st saw almost freezing temps so the crew covered the beds to protect them from frost. Beds were renovating in the tea/corner garden. Woodchip/cardboard mulch was used on the blackberries. Weeding of four garlic beds in the Madonna field finished off the month. Harvested Arugula, Spinach, Tatsoi, Salad Mix, Swiss Chard and Kale for Hopewell market. Harvested stinging nettle for flush tea, took 4 days to dry in solar dryer. Harvesting of house lettuce, arugula and six nice stalks of asparagus by the 23rd. All of the above were washed and bagged for Hopewell market and sales to Kindle Café. Participated in Hopewell market on Wednesdays, yielding $1,192.31. Delivered spinach, salad mix and kale to Kindle Café. The first seedling order of 120 plants to Whole Earth was on the 20th. Chickens were moved during a fierce and windy rainstorm. Firewood was cut and a dog pen was sited and constructed. Hired a mason to build a better walkway and steps to access the main drain valve and wetlands by greenhouse. And ultimately egg washing and packing for Hopewell market.